An ABC investigative news report uncovers New Testament references inscribed on weaponry used by the US military in Iraq and Afghanistan. 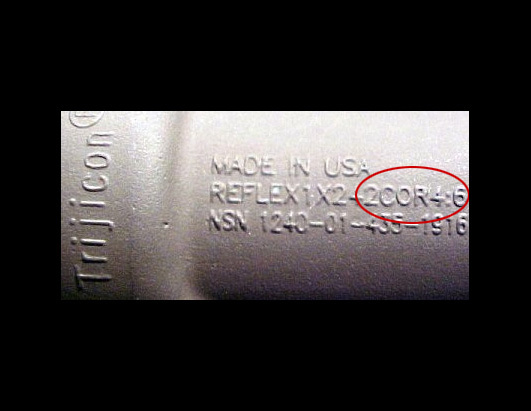 The manufacturer claims to "always" add Christian notation to its gun sights (a disgusting use of the New Testament in itself if you ask me), presumably, and thankfully, indicating the markings were not meant specifically for use by the military. Considering the small and coded nature of them – the abbreviated chapter and verse could probably be mistaken for a serial number – it's certainly believable that these went unnoticed by the powers that be. Either way this is an outrageous abuse. Now in the open, it's also a further impediment (reminiscent of the Christian imagery discovered on Pentagon war reports) to our efforts to assure the rest of the world that U.S. foreign policy is not driven by religious fervor. See ABC's pictures in a slideshow here. As a Christian, I am offended by Trijicon’s dismissal of the criticism saying that the organization raising the issue is “not Christian.” This is not a time for attacking critics, it is a time for Trijicon to clean up its behavior. As a patriot of this nation, I am outraged at this corporation’s lack of appreciation for our first freedom—religious freedom—and its corollary of separation between institutions of religion and institutions of government. As an advocate for inter-religious cooperation, I am saddened by this insensitive effort to minimize people who do not embrace Christianity.